The trees grow naturally in open forests, along forest margins and river banks and in damp rocky places. 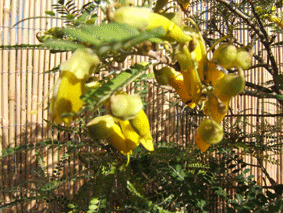 Sophora is an Arabic name for leguminous tree. About thirty species are among the genus which can be found in sub-tropical and temperate regions of both hemispheres. The varieties we mention here are both native to New Zealand. Microphylla refers to this varieties small leaves, which makes this tree ideal for bonsai. This Kowhai is found naturally on limestone rocks in the Takaka district, North West South Island. The flowers are 4 to 5cm long and are produced mainly during October. 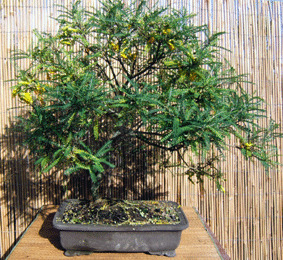 It does not have the tangled juvenile growth of Sophora microphylla which also makes it desirable as a bonsai. Tetraptera means having four wings referring to the flowers. This is the most widely known of the yellow flowered Kowhai. They can be found in the North Island along stream sides and forest margins. Golden yellow flowers can be up to 6cm long and start to appear in early spring. As mentioned earlier these flowers are adored by birds so once they start flowering as a bonsai it pays to give them some protection. The birds seem to find it necessary to tear the flowers apart to get at the nectar which can be devistating if you have been waiting a year for a floral display. Sophora 'Gnome' is an extremely slow growing form, there are reports that in the Christchurch Botanic Gardens there are trees that are only 2.5m tall after 30 years in the ground, not a bonsai pot. Sophora 'Dragons Gold' is a recent hybrid which has become very popular in garden centres. I think mainly because of its ease of propagation, most Kowhai need to be grown from seed which in itself is not an easy process. This hybrid grows readily from a cutting, allowing for a quicker turn around of plants and a tree that will flower almost straight away. They are best grown in partial shade and like to be kept damp. A little Blood and Bone through spring and summer is also helpful. Kowhai do tend to loose a few leaves over winter if you are in a cold area, they will recover in spring, when regular pinching of the new growth helps keep the plants compact. The only problems apart from birds which can break small branches while trying to tear your flowers to shreds are caterpillars. These small green caterpillars strip leaves from the central spines they can also ring bark small branches. Keep an eye on your tree and spray with insecticide at any sign of damage.